Seventeen-year-old Ruby is a Fireblood who has concealed her powers of heat and flame from the cruel Frostblood ruling class her entire life. But when her mother is killed trying to protect her, and rebel Frostbloods demand her help to overthrow their bloodthirsty king, she agrees to come out of hiding, desperate to have her revenge. Despite her unpredictable abilities, Ruby trains with the rebels and the infuriating - yet irresistible - Arcus, who seems to think of her as nothing more than a weapon. But before they can take action, Ruby is captured and forced to compete in the king’s tournaments that pit Fireblood prisoners against Frostblood champions. Now she has only one chance to destroy the maniacal ruler who has taken everything from her - and from the icy young man she has come to love. Ruby and her mother are hiding in Frostblood territory. The rest of their kind have been killed. One day, Frostblood soldiers arrive in the village and Ruby is ratted out by a villager. Ruby is captured and her mother is killed. Ruby is imprisoned for six months until two Frostbloods called Arcus and Brother Thistle help her escape. They take her back with them because they need a Fireblood to help them defeat the king. Ruby runs away (with a horse) and comes across a camp. She doesn’t join them by the fire, although she does heal a child. Arcus finds her and takes her back. Someone starts a fire and Ruby helps Arcus put it out. They begin her training, as she needs to learn to control her powers. Arcus also starts to teach her to handle a sword. Arcus and Ruby bond a bit since it’s a weird hate-to-love relationship that I hate. Ruby helps him make a sword. Ruby struggles to harm anyone, so Arcus says she’s never going to be ready to kill the king. Ruby gets angry and sets fire to his hood. Bad move, since Arcus’ face has tonnes of burn scars already. 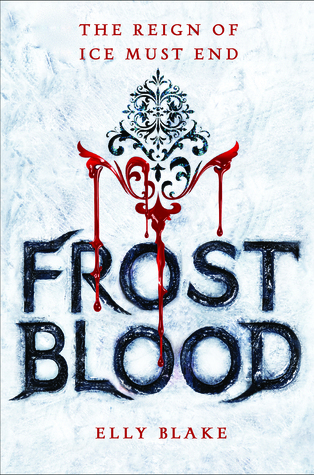 According to myths and prophecies, the Frostblood king’s throne gives him extra power. If it’s destroyed, a curse will be broken. Brother Thistle thinks Ruby is the child of light from the prophecies. Brother Thistle upsets Ruby by suggesting she heal the king after destroying the throne instead of killing him. Arcus thinks that Sage told him that the Fireblood girl is the key to saving the kingdom. Ruby accuses Brother Lack of starting the fire. He admits to wanting to save everyone from her. Brother Lack goes to alert the garrison about the Fireblood. The monks try to hide Ruby but she is captured by Captain Blake and taken to the king. The king can’t be hurt by fire while in the throne room because the throne absorbs Ruby’s power. The king sends Ruby to face his pit creature. If she survives, she’ll be allowed to fight in the arena. Ruby fights the king’s champion in the arena and kills him. She becomes the new champion and has to dine with the king. Marella calls Ruby her protege. Clay, one of the villagers from the beginning, has been captured and sent to the arena. Ruby fights with him. Captain Drake kills him, and Ruby kills Captain Drake in front of his family. The king wants Ruby to join forces with him and the Minax, the shadow creature. Marella says the Minax has chosen Ruby and if she bonds with it, she’ll still be able to control herself. Arcus enters the arena and announces himself as the king’s older brother and the rightful heir to the throne. There’s a bit battle, although we don’t see most of it. Ruby goes to the throne room to destroy the throne. She’s followed by King Rasmus. She accepts the Minax into her body and she and Rasmus almost kill Arcus, but Ruby takes back control. She destroys the throne and sets the Minax free. She becomes ill and passes out. She wakes up just after Rasmus’ funeral and just before Arcus’ coronation. Arcus and Ruby get together.